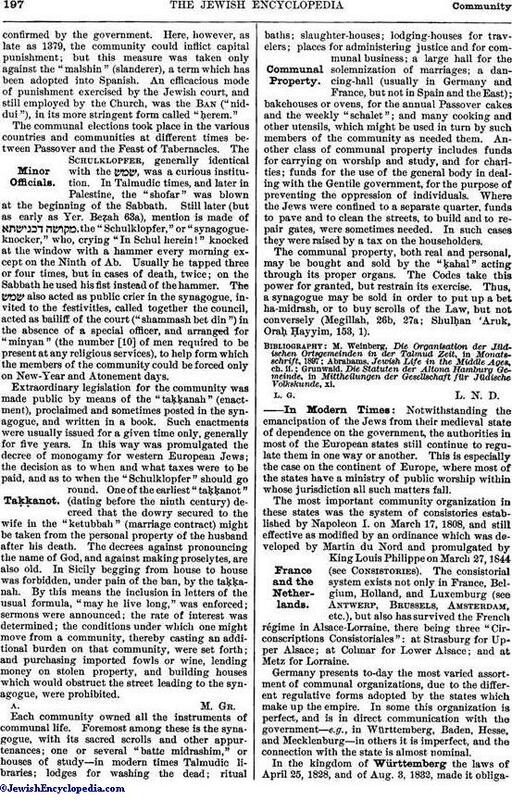 The communities, whether found in ("villages"), ("cities"), or ("walled towns"), were composed of ("full citizens"—residents of more than twelve months' standing), ("half citizens"—residents of from thirty days' to twelve months' standing), and "transients"—those who remained less than twenty days in the place. At the head of the community was a governing board ( ) consisting of at least three members, but usually of seven, and, in later times, of twelve. If brothers happened to be on the board, they had one vote only between them. All communal offices, even that of physician, were filled by appointment from the "court" with the concurrence of the community. The governing board, even where it had absolute authority, was expected to observe the wishes of the community. Membership in the board, as well as other communal offices, was sometimes hereditary. The Jews of ancient Rome were governed by a "gerusiarch," that is, a president of the communal council ("gerusia"); an archon ( or );an Archisynagogue ( ); etc. (Berliner, "Magazin," i. 66; for the later communal government at Rome see Berliner, ib. ii. 31). In Sicily the following expressions were current: "dienchelele" (chief district rabbi); "manigliori" (from = "keeper of the keys of the synagogue"); "presbyter" (ḥazzan and shoḥeṭ); "sacristano" ( ); "celebrare missam" (literally, "to celebrate mass"), to conduct services, etc. (Güdemann, "Geschichte des Erziehungswesens," ii. 71, 281). At Cologne the president of the community was called "Judenbischof" (Jewish bishop), and was assisted by a chapter. At Speyer the archisynagogue, appointed by the Catholic bishop, was at the head of the community. The governing board was subject to the "dayyan" (judge, also called "ḥakam," or "zaḳen"), who was ordained by the nasi or exilarch, and was the final authority on ritual, civil, and political questions. He decided unaided in money matters (without being obliged to make restitution in case of an error of judgment), where otherwise three lay judges were required. Criminal cases were decided only by three scholars of standing ( ), who were usually elected for life to insure impartiality and respect. They did not, in general, draw a salary, but when their entire time was devoted to the affairs of the community, they might receive means sufficient for a bare subsistence. They had supervision over all religious and political affairs. Those who had been ordained at Babylon were called "rabbonim"; those ordained in Palestine were called "rabbis." The title of "ḥaber" (associate) was bestowed upon a person who had rendered special services to the community. He was considered in many cases as arbitrator. 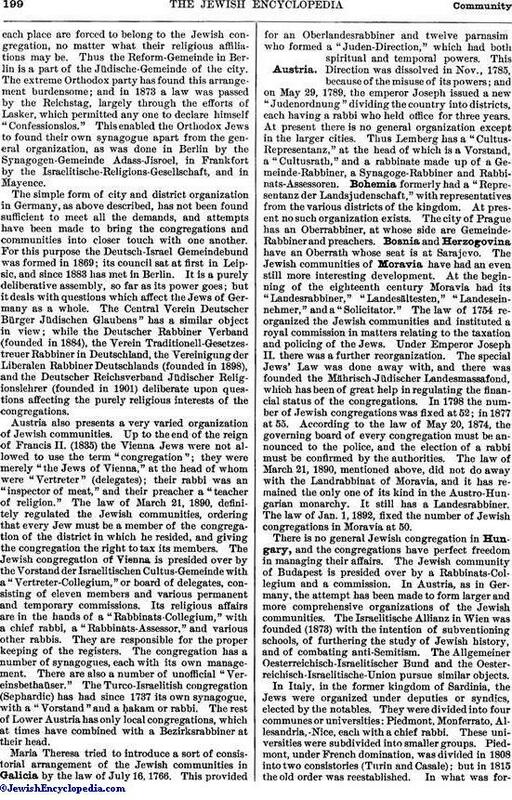 A community consisting of more than ten members was a synagogal community, and was obliged to secure a synagogue, the judicial and outer affairs of which were in the hands of a committee elected from the members of the governing board. It was not permissible to sell or exchange the synagogue, except in cases of extreme necessity, nor could the old synagogue be pulled down before the new one was built. Affairs pertaining to the ritual and liturgy were in the hands of the archisynagogue. (This term when applied to a woman, as in old Roman inscriptions, meant, no doubt, merely the president of a woman's philanthropic society, like the "parnesessa" at Rome in the sixteenth century.) The archisynagogue was especially honored, his office being for life and sometimes hereditary. In the Diaspora there were honorary titles, such as "fathers," or "mothers, of the synagogue"; thus, the title of "mater synagogæ" or "pateressa" was conferred upon Dona Gracia Mendesia. The "rosh ha-keneset" (archisynagogue) was subordinate to the "ḥazzan ha-keneset," whose orders were authoritative in synagogal and in general matters; he was also executor of the punishments decreed by the court, and performed the functions of the later "shammash," who is otherwise called ("the messenger of the court") in the Talmud and by the Geonim. The ("delegate of the congregation," or "leader in prayer") stood before God as representative of those who did not understand the import of the prayer. He, too; was an unsalaried official. All worthy persons, however, and especially those in straitened circumstances or in trouble, were allowed to lead in prayer on days of fasting and repentance. The lesson from the Torah was read by the ("reader") although any one called upon was to read his own section. The weekly section was translated into the Aramaic vernacular by the ("dragoman"), who was entitled to compensation; and in order to insure the requisite minimum for the service, ten men, called Baṭlanim, received a regular salary to attend. The school, like the synagogue, was under the supervision of the community, which appointed the teachers (called variously , ). The latter were paid by the parents of the children of school age, but this salary was generally so small that the community contributed an addition as ("relief"). No one who was unmarried, or under the age of forty, was employed as teacher. An assistant teacher ( ) was paid by the community when the pupils numbered forty or more; a second assistant being added when the number reached fifty. Private teachers were also allowed. A father or guardian was obliged to send his child to school, and he was not allowed to send the child to a neighboring school if there was one in his own community. Most of the communities had their own schoolhouses ( ), often adjoining the synagogues. The management of the alms fund was an important matter; it was in the hands of a special committee ( ), chosen generally from among the members of the governing board, and hence also called . The mere management, which involved no responsibility, was in the hands of one person; the levying of contributions, from which women, orphans, and the poor were exempt, was in the hands of two persons working together, who had the right to fine delinquents. The distribution was in the hands of at least three persons, for they had to decide on the amount of the relief, and any court dealing with money matters had to consist of at least this number. This office, also, was often hereditary, and the antecedents of the incumbent had to be irreproachable. In expending the money the wishes of the givers were to be considered. There were two chief classes of poor-funds: (1) The ("box"), for feeding and clothing the resident poor. Every Friday evening a collection was taken up for them, and they were provided for during the coming week. (2) The ("dish"), for the support of transients, for whom collections might be taken up on any day, in such amounts as were necessary. Non-Jews, also, were to be relieved, but those who begged from house to house received only a trifle from the fund. On special occasions, as on Purim, the poor received additional gifts. 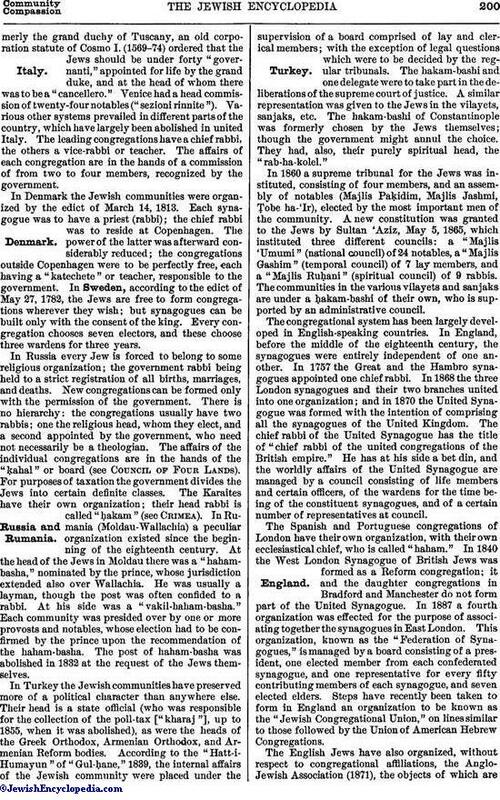 Money was also distributed in the synagogues for philanthropic purposes. 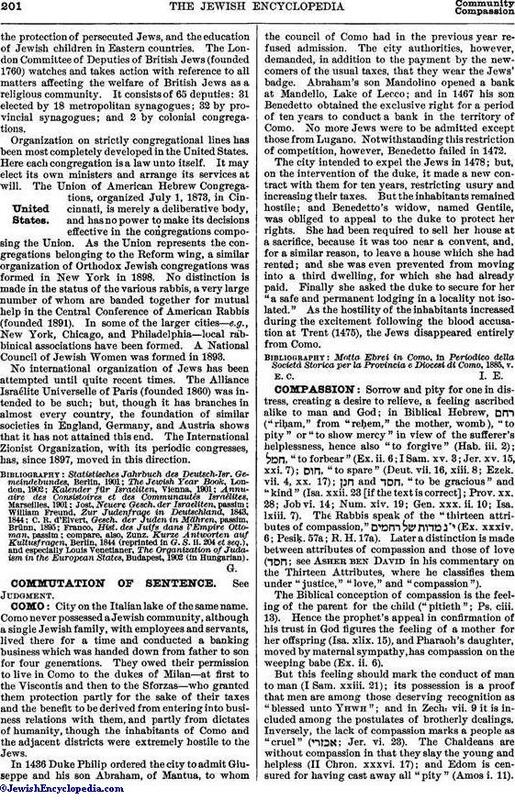 Orphans were cared for by their guardians, or, if there were none, by the local court ( ). The irregular or special communal taxes werelevied only when occasion demanded, and only upon those directly concerned. This fund was managed by the treasurer ( ), who was a member of the governing board. 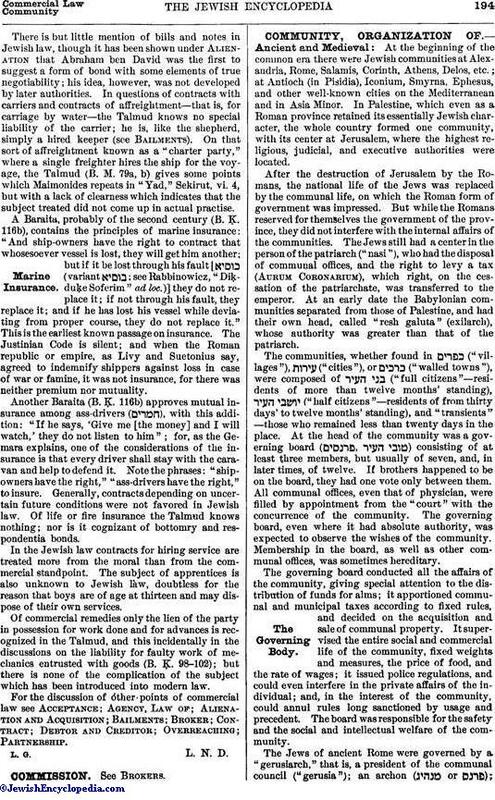 The budget included the expenses (1) of the synagogue and its service, to which the full citizens, including orphans, contributed; (2) of education, such as the building of the schoolhouse and the occasional relief of the teacher, to which all members of more than two months' standing contributed; (3) of the poor-fund, consisting of (a) the "ḳuppah" (weekly food distribution), supported by all members of more than one month's standing; (b) the "tamḥui" (daily distribution of meals), supported by those of more than three months' residence; (c) the clothing fund, maintained by all residents of more than six months' standing; and (d) the burial fund, supported by all those of more than nine months' residence; (4) of the public safety, such as for walls, soldiers, etc., to which all full citizens and all landowners, and even orphans, contributed, Talmudic scholars only being excepted; (5) of the water-works, to which only those benefited contributed. The state taxes were apportioned among the communities, which divided them among their members. Only scholars were exempt from the poll-tax, while the tax on real estate was paid entirely by property-owners. Along these lines developed the life of the community ("ḳahal," pronounced "kohl" in the disricts where German-Polish was spoken; compare the term "kohlstibel" = "communal room"). Yet the rabbi (the designation [compare , applied to women to-day] was dropped toward the end of the twelfth century, being later replaced by = "rabbi" [compare Zunz, "Literaturgesch." p. 284; Rahmer's "Jüd. Lit.-Blatt." vii., No. 31; Salfeld, "Martyrologium," xxiv. ; on and at Aden, see Rinman, "Massa'ot Shelomoh," pp. 10, 110]) no longer had the high position enjoyed by the "resh galuta" of Babylon and the "nagid" in Egypt until the fifteenth century. Until the end of the thirteenth century he was independent of the community as an unsalaried official. In England, before the expulsion, there was one "presbyter omnium Judæorum Angliæ.," appointed by the king, generally for life. In Poland during the sixteenth century he was appointed by the king, in whose name he levied taxes and held court. 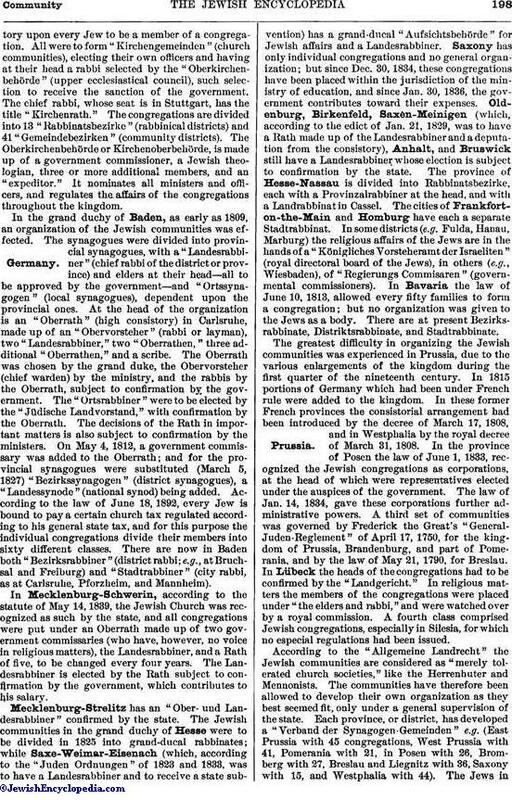 The rabbinate in Bohemia was in a similar position during the same century; but here there was no regular district rabbinate, as in Galicia and Moravia. In Algeria at the beginning of the fifteenth century the appointment of the rabbi was subject to the sanction of the government. In countries bordering on the Rhine he was appointed every three years. Rabbinical synods were held in some places as early as the thirteenth century; at Bologna, after 1416. In Poland they were held annually, and known as the "wa'ad arba' araẓot," Council of the Four Lands. In order to put an end to unpleasant rivalry for leadership in prayer, a salaried reader was appointed, who frequently discharged other religious functions and received the title (ḥazzan). In his musical functions he was assisted by a "bass" and a "singer," and occasionally by boy choristers. The ḥazzan was usually elected by the unanimous vote of the congregation: it is on record that one refused nomination at the hands of the Archbishop of Cologne. The taxes which the governments demanded from the communities were often paid with difficulty. In Spain and in England, about 1273, even children of ten had to contribute, and in the latter country the Jews at times paid one-twelfth of the royal revenues. In Anjou the taxes were collected by a "sindicus et procurator universitatis Judæorum." Where the Jews formed one-tenth of the population they often paid one-fourth of the taxes, more than one-half of this sum being frequently paid by the wealthier members of the communities; hence the moneyed aristocracy which arose toward the end of the seventeenth century. The rabbi (also his widow), other professional scholars, all salaried officials, and some physicians, were exempt from taxes; artisans paid only the poll-tax; in Christian countries the ḥazzan paid, but not in Mohammedan. Some communities elected a committee of ten to choose the rabbi, the ḥazzan, and the sexton ( ). These three received perquisites. In Poland, Russia, and Hungary their salary was raised by collections at weddings; and they received special gifts ("kibbudim") during festivals. Wandering beggars were, and still are, a plague to communities, particularly as the latter were responsible for any trespasses of the former. At Metz every one was subject to taxation if a beggar remained eight days. 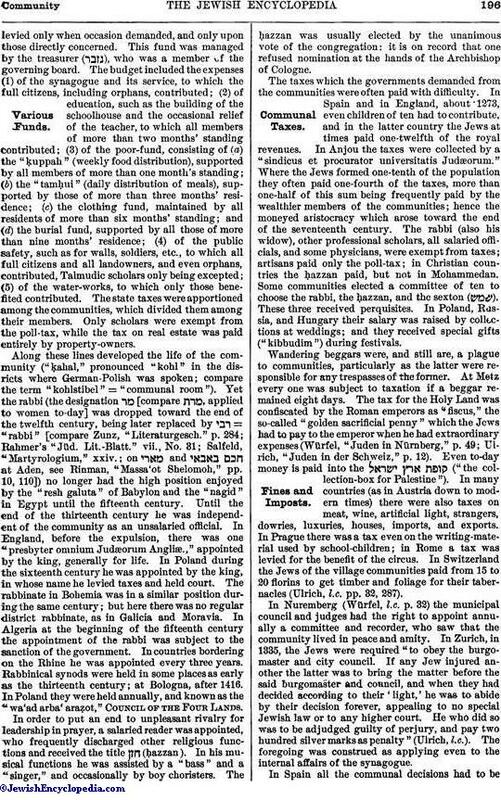 The tax for the Holy Land was confiscated by the Roman emperors as "fiscus," the so-called "golden sacrificial penny" which the Jews had to pay to the emperor when he had extraordinary expenses (Würfel, "Juden in Nürnberg," p. 49; Ulrich, "Juden in der Schweiz," p. 12). Even to-day money is paid into the ("the collection-box for Palestine"). In many countries (as in Austria down to modern times) there were also taxes on meat, wine, artificial light, strangers, dowries, luxuries, houses, imports, and exports. In Prague there was a tax even on the writing-material used by school-children; in Rome a tax was levied for the benefit of the circus. In Switzerland the Jews of the village communities paid from 15 to 20 florins to get timber and foliage for their tabernacles (Ulrich, l.c. pp. 32, 287). The communal elections took place in the various countries and communities at different times between Passover and the Feast of Tabernacles. The Schulklopfer, generally identical with the , was a curious institution. In Talmudic times, and later in Palestine, the "shofar" was blown at the beginning of the Sabbath. Still later (but as early as Yer. Beẓah 63a), mention is made of , the "Schulklopfer," or "synagogueknocker," who, crying "In Schul herein!" knocked at the window with a hammer every morning except on the Ninth of Ab. Usually he tapped three or four times, but in cases of death, twice; on the Sabbath he used his fist instead of the hammer. The also acted as public crier in the synagogue, invited to the festivities, called together the council, acted as bailiff of the court ("shammash bet din") in the absence of a special officer, and arranged for "minyan" (the number  of men required to be present at any religious services), to help form which the members of the community could be forced only on New-Year and Atonement days.